Downtown businessmen are at a complete loss over what to do with the garbage from their operations and want the city to either take it or designate a dump they can use. 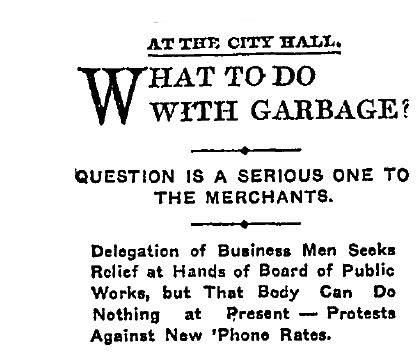 â€œThey declare that the Board of Health has refused to let further deposits of garbage or refuse be made at the old dumping ground to the southeast of the city and state that if the city does not come forward with a proposition to locate a new dump, or to cremate the stuff, they will be helpless to get rid of the accumulations of each dayâ€™s business,â€ The Times says. City officials say they donâ€™t know what to do because the local sanitation system is strictly for residential use. The Times says that local ordinances define garbage as â€œanimal and vegetable refuse from the kitchens.â€ As a result, officials feel no need to deal with commercial waste, although they concede it is a problem.